The organization, the Friends of Bright Leaf, is a part of the Austin Community Foundation. Our purpose is to conserve and enhance the area Georgia B. Lucas established as Bright Leaf and to promote the public's enjoyment, understanding, and appreciation of this area. Georgia Lucas specified that "all hikes will be guided hikes". The Friends group leads these GUIDED HIKES for all sorts of groups. We have led groups of young folks, such as the entire second grade of a local elementary school. We have led groups of senior citizens as well. Our hikes can be the entire loop #3 that is four miles long, or as short as a stroll beside Dry Creek. The groups can be as small as one or as large as 100+. Just email Bright Leaf at FriendsOfBrightLeaf@gmail.com to arrange a hike and please allow some lead time to find a volunteer for your group. 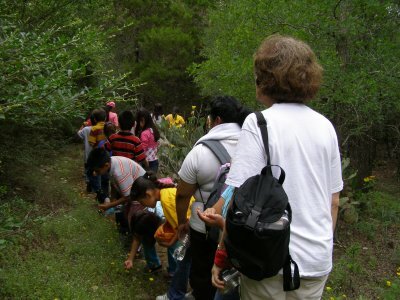 We also offer hikes that are open to the public every month. Just meet us at the parking lot off 2222 and Creek Mountain Road at the date and time listed on the calendar. Please remember that there are no dogs and no bikes allowed in Bright Leaf. Support Bright Leaf and the Friends group by sending in a DONATION. and various projects and improvements in the preserve. we offer extra hikes in April and October to encourage everyone to enjoy nature. See the Calendar page on this website or call for more information.